Last week, I posted a chart showing the stark decline in Haynesville Shale production versus U.S. gas production. Yesterday, EIA posted the above chart, which tells the same story with a different graphic. While overall natural gas production growth was only up about 1% between 2012 and 2013, Haynesville production fell off 27%, while Marcellus Shale production was up 61% over that same period. The Marcellus benefits from having a wet gas horizon, which encourages drilling even with low natural gas prices. The region has also seen improved gathering infrastructure and vast improvements in production per well, even though the rig count dropped by 21%. 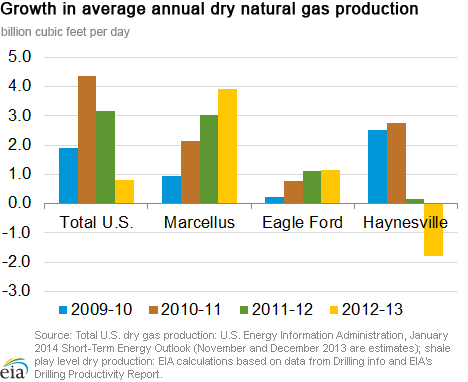 Here is a link to the EIA's 2013 lookback on natural gas production (this link is likely to change in a week or two).